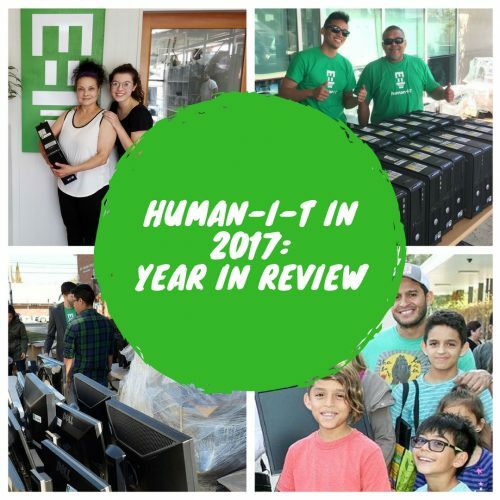 2017 has been a remarkable year at human-I-T. Our organization has helped more families and individuals with access to technology and the internet compared to previous years. 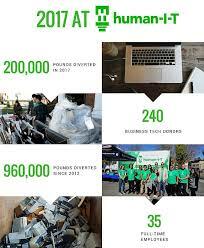 We have expanded to over 35 full-time employees, moved into a new warehouse and diverted more e-waste away from landfills than before. Let's look back at human-I-T in 2017. One thing that is always clear to us is our mission to help those in need. We are honored to receive this award and will continue to work closely with our partners and friends to close the digital divide. Check out the video above to hear from our Co-Founder and CEO Gabe Middleton. 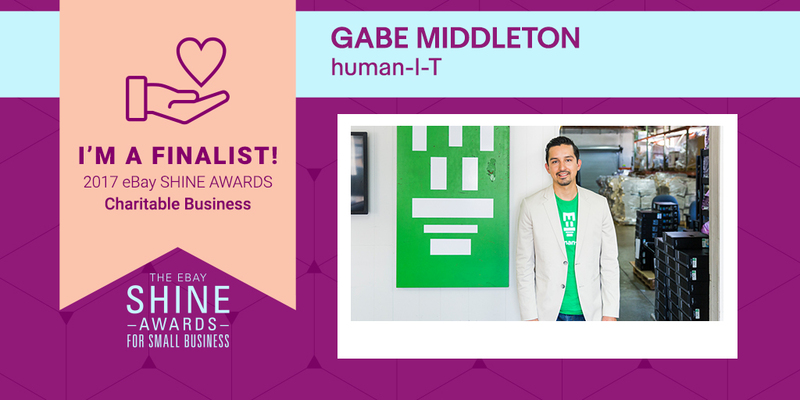 2. human-I-T Named Finalists In The eBay SHINE Awards This past summer was an exciting time for us. human-I-T was named one of 15 finalists in the eBay SHINE Awards; one of three contenders to be named winner for the Charitable Business category. Thank you to everyone who voted for the eBay award and we look forward to our next round of voting this year. 3. U.S. HUD, Section 8, Frontier Communications & human-I-T Announce Partnership With great partners creates great opportunities for those in need. Our new partnership between human-I-T, Frontier, LA City Council President Herb Wesson & the Housing Authority of Los Angeles are working to connect 3,000 low-income households throughout Los Angeles. 4. human-I-T's Co-Founder & CINO James Jack Wins SXSW Community Service Award Another round of exciting achievement this year. 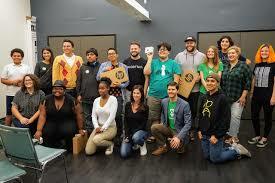 Our Co-Founder James Jack was one of 6 individuals to win the Community Service Award from SXSW. The award ceremony will be taking place this year in Austin, Texas where the winners will be honored for their community work. We look forward to meeting everyone there. 5. human-I-T Partners With The National Digital Inclusion Alliance human-I-T has partnerships with numerous organizations. One in particular that we were excited to announce in 2017, is working with the National Digital Inclusion Alliance to support local and national efforts that expand access to technology, and new or lower-cost broadband programs. 6. Meet The Team Behind The Scenes Our work is not possible without the dedication from our Operations team. They go above and beyond to turn e-waste into opportunities for the communities we serve. Thank you for all of your hard work in 2017! 7. Breaking News! human-I-T Wins Best Buy Foundation Grant We received a grant from the Best Buy Foundation to provide vocational training to youth (aged 13-18) who will learn to help repair computer hardware for our donation recipients. 7. 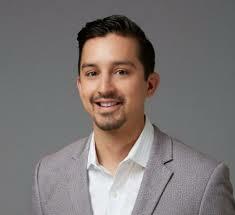 Coors Light Nominated Gabe Middleton For $25,000 Grant Gabe Middleton, CEO and Co-Founder of human-I-T was nominated as one of 12 Coors Light Líderes as a finalist for his commitment to empower the Latino community. Coors Light believes in rewarding the dedication and tenacious spirit of emerging leaders who selflessly work hard to achieve success by helping others. 8. PowerOn Center Opens In Long Beach We're excited to announce that PowerOn's fifth national center has opened at the LGBTQ Center of Long Beach. PowerOn is operated by Straight But Not Narrow, human-I-T, The Trevor Project, and LGBT Technology Institute and provides at-risk, LGBTQ youth in shelters and community centers with access to technology (tablets, laptops, and cellphones) and important online resources. 9. By The Numbers Another reason why 2017 was one of our biggest years to date. We diverted more e-waste away from landfills than in any previous year. During the pass five years overall, we prevented almost a million pounds of e-waste from landfills. 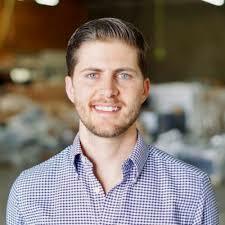 Have over 240 business tech donors and grown to 35 full-time employees.